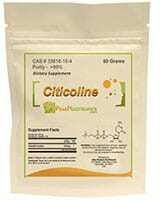 Cytidine diphosphate-choline (CDP-choline), also known as citicoline, is a supplement that is available over the counter in many countries. It has a myriad of uses, from appetite reduction right through to treatment of cocaine withdrawal – but perhaps its most important application is as a nootropic. Similar to many other choline supplements, there is mounting evidence to suggest that CDP-choline can improve memory retention and focus in healthy adults with next to no side effects. In a 2008 study, 16 healthy adults took CDP-choline for 6 weeks at doses of 500 mg to 2000 mg. Researchers found that supplementation led to beneficial changes in phosphate metabolism and cell membrane turnover in the frontal lobes of the participants’ brains. The magnitude of these changes was actually greater in individuals that took the 500 mg dose than those that took 2000 mg. These changes are likely to be associated with improved focus and mental energy. 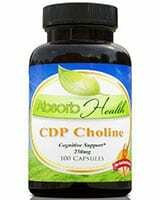 >> Looking to Buy CDP Choline? Click here to see our recommended sellers. These findings are consistent with results of studies examining the clinical effects of CDP-choline supplementation. A study of 60 adult women found that a daily dose of 250 mg of CDP-choline significantly improved focus, while 500 mg appeared to be slightly less effective. In older persons with memory deficits (but not dementia), a dose of 500 to 1000 mg CDP-choline improved memory performance on recall tests. Another study found that supplementation of 1000 to 2000 mg CDP-choline improved verbal memory, and found that the effect was greater at the higher dosage. CDP-choline has been used for the treatment of a variety of neurological conditions, including Alzheimer’s disease, other forms of dementia, stroke, attention deficit hyperactivity disorder, head trauma and Parkinson’s disease. In many cases the evidence to support these specific uses is limited; however, there is convincing proof that CDP-choline has neuroprotective properties. CDP-choline reduces the rate of neuron degeneration and death in rats with induced Alzheimer’s Disease, and has also been shown to both improve memory retention in aging rats and prevent memory impairment in young rats exposed to impoverished environmental conditions. 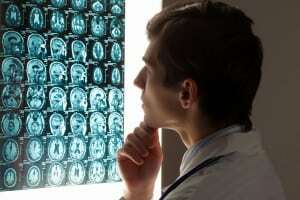 A 2001 study found a significant reduction in lesion size in stroke patients receiving CDP-choline supplementation compared with those receiving a placebo. However, in 2012 a huge study of 2298 patients failed to find a significant improvement in morbidity and mortality rates when patients were supplemented with CDP-choline following stroke. Accordingly, it is not currently recommended as a treatment for stroke but continues to be the subject of investigation. The neuroprotective benefits of CDP-choline extend beyond the brain itself: it has also been shown to improve visual function in patients with diseases affecting the optic nerve, including glaucoma and non-arteritic ischaemic optic neuropathy. Choline is an important precursor for neurotransmitters, the chemicals responsible for communication between neurons, as well as many cell membrane phospholipids. Because the brain preferentially uses choline for neurotransmitter synthesis, low choline levels can cause cell membrane health to suffer as cell membrane phospholipids become depleted. 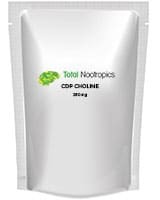 CDP-choline supplementation has been shown to increase the amounts of the neurotransmitters acetylcholine, norepinephrine and dopamine in the brain as well as the numbers of dopamine and acetylcholine receptors. It also has a key role in preserving a whole host of cell membrane phospholipids, which is likely to account for many of its neuroprotective effects. 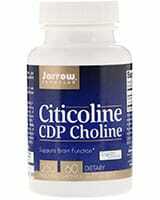 CDP-choline also stimulates synthesis of glutathione, an important antioxidant that reduces cell damage within the brain. Finally, CDP-choline can help offset the excessive release of glutamate and free fatty acids that accompanies ischaemic brain injury. Daily dosage: For healthy users, 500 mg is a good starting dose, either divided or as a single dose. Note that many of the beneficial effects on memory and focus are actually greater at a lower dose. 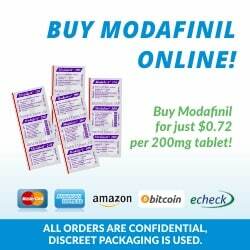 Daily doses of up to 2000 mg can be used depending on individual needs. Safety: appears to be safe to use for up to 90 days but has not been evaluated for long term use. 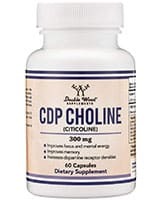 CDP-choline has been shown to alter the activity and levels of certain hormones in the body, including those involved in cortisol metabolism and reproductive function, as well as thyroid hormone and growth hormone. For most people these modest changes are harmless, but they may be harmful to individuals suffering from medical conditions such as diabetes, depression, Cushing’s disease or polycystic ovary syndrome. It is also best to avoid using CDP-choline while pregnant or breastfeeding, as its safety in this context is unknown. Originally posted on March 23, 2015, last updated on December 6, 2018.